Why Does This Comic Book Hero Appear On So Many New Guinea War Shields? 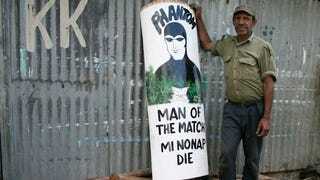 Lee Falk's hero the Phantom made his comic book debut in February 1936, but he also appears on dozens of traditional war shields made by people from the Central Highlands of Papua New Guinea between the 1960s and 1980s. Why? The Wahgi people of Papua New Guinea have long made enormous shields from tree trunks, and have continued to make these shields as a form of ritual artwork. In the late 20th century, many of these Papua New Guinea highlanders began incorporating "new ideas" into their traditional works, so that shields bore emblems of football teams, beer brands, and, yes, the Phantom. Western comic books became widely available in the region after World War II, and the Phantom became a particularly popular character. Art educator and dealer Michael Reid notes that two things in particular made the Phantom an ideal subject for a war shield: he is a hero who protects his home and he is known as "The Man Who Cannot Die." Just as many comic book readers adopt the emblems of their favorite heroes, so too have these artists taken the symbolic power of the Phantom and adapted it to their own traditions. Six 2 Six, a phrase used by the Gilgalkup sub-group of the Senglap people, normally refers to an all-night party, but in this case it means that its owner could fight from 6am to 6pm.